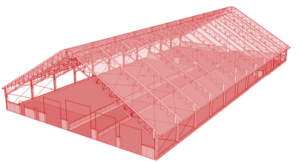 The Epic Building Series defines the new style and strength of fabric buildings. The straight roof design offers a new clean look and the straight sidewalls give the building instant height and interior clearance. The building includes a standard eave. The straight wall design offers flexibility in door locations and sidewall features such as curtains and screening. Exterior finishing options allow the building owner to style the building to their architectural style. Copyright 2018 © Vertical Building Solutions. Web Design by BIG Interactive.